rec. 2015, l’église Saint-Eustache, Paris. Vincent Genvrin makes several good points on Liszt in general in his booklet notes for this release, indicating “the Bachian fake nose” with which he dressed his organ music of the 1850s. Dig a little beneath the titles, and the connections with Bach vanish pretty much into smoke, the chorale from Ad nos, ad salutarem undam for instance being based on a Meyerbeer opera rather than Lutheran church music. The programme opens with the symphonic poem Orpheus, which was transcribed for organ by one of Liszt’s students, Louis Robilliard, and later revised by the composer. The result is a rich feast of high romantic organ sound, the instrument pushed as far as it can be towards the original orchestration, and the extended harmonic progression and resolution colouring a magnificently large-scale canvas. Andreas Rothkopf on the Naxos label (review) has a comparable programme, and this highlights the differences between German and French instruments, the expressive range of colours and dynamic shading from the organ at Saint-Eustache in Paris conveying a more poetic experience. The gloriously heroic apotheosis that closes the Fantasy and Fugue is followed by another of Robilliard’s transcriptions, Funérailles, which is a portrayal of darkness, celestial transfiguration and defiant remembrance. After all ceremony is concluded, the only thing left is the graveside defined by the austere notes of Am Grabe Richard Wagners. The only thing missing from the presentation of this album is the usual list of organ registrations in the booklet, but this is more production that centres around the music rather than technical peripheries. Consolation IV emerges in this narrative as a kind of epilogue, nicely rounding off this immersive Lisztian experience in a mood of ecclesiastical timelessness. 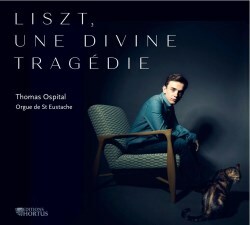 The award-winning Thomas Ospital is clearly a name to look out for in the organ world, and this very well recorded album is a masterclass in expressive musicality even when the compositions demand the most strenuous dexterity from the performer.